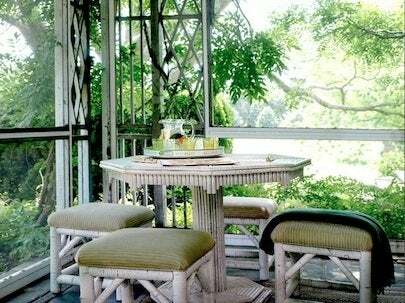 Unlike the glass-enclosed garden rooms or conservatories in the UK—glazed interior spaces that provide visual access to the great outdoors—garden rooms in this country are generally open-air spaces (porches, screened-in sunrooms, covered terraces, or patios wrapped with tall hedges) that ease transition from interior spaces to an exterior garden or lawn. Whether designed as a retreat for quiet contemplation or as an outdoor entertaining area for gatherings of family and friends, a garden room is most appealing when merged with some indoor creature comforts. Long Island, New York designer Andrew Maier offers these suggestions for bringing out the best in outdoor living spaces. 5. Make it cozy. 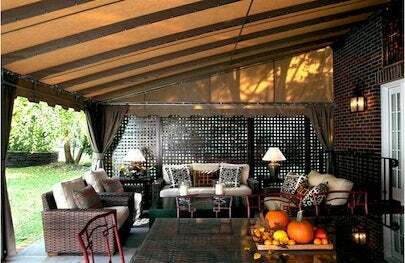 Defining outdoor spaces with comfortable furnishings and easy-care fabrics enhances their comfort and allure. “Outdoor fabric companies are now making softer, less “plastic-y”, and more ‘fool-the-eye’ weather-resistant fabrics than ever before,” says Maier, who prefers muted colors for outdoor rooms. “Colors for outdoor fabrics should never be too artificial—keeping some ‘muddiness’ in the colors of the fabrics will ensure that in the harsh light of day, things still look natural and not jarring,” he says. 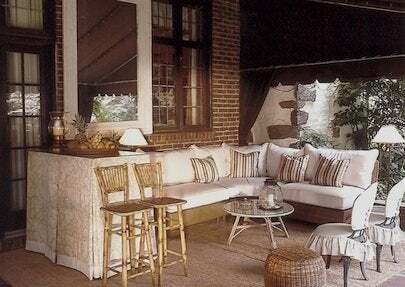 “When I sit in an outside room, day or night, I want my eyes to be relaxed—not overly invigorated by a whole bunch of bright, busy fabrics.” He also gravitates to large furnishings in outdoor rooms. “I like an outdoor sofa or lounge chair that is grounded, bulky, and invites you to fall into it—when you’re outside, nothing small and fussy ever seems comfortable,” he says. To see more of Andrew Maier’s work, visit his website here.